I’ve been a long-time fan of the Talking Heads and David Byrne’s individual work for many years. So much that I was ecstatic to finally have the opportunity to read HOW MUSIC WORKS (McSweeney’s, 2012) while stuck in an airport earlier this month. My immediate reaction is that anyone who creates things (music, art, books, etc.) should read this book. Additionally anyone who works with creative people should read it too. David Byrne hits the figurative nail on the head when it comes to the ins & outs of art and the business of making and distributing it. For anyone who was able to observe me while reading this book, there was lots of head nodding, post it notes (for myself), and smiling. HOW MUSIC WORKS is that good. How does this translate to a writing career? Does one create the book that expresses the emotions vs. creating a work that will only appease readers (i.e. writing to trends). Will this be a lifetime commitment, where it’s the sum total of a lifetime of writing that matters vs. the size of your bank account? And let’s talk about contracts and “crazy diva behavior” – who will be your support? It’s good to plan one’s support crew in advance to hopefully avoid such a rollercoaster. Other fascinating chapters that I bookmarked to re-read include Byrne’s discussion on the distribution models of music. For anyone who works in publishing, it’s an eye opener. Last but not least Byrne delves into the evolution of creativity and community, as well as the benefit of the overall arts community ; how we need to support all artists, that fueling the creativity in a city benefits the entire city. This means more businesses, more participation from citizens, and an almost magnetic effect in how the city’s population will grow as well. I dare say that this is one of the many reasons particular cities have thrived in the arts community. Minneapolis/St. Paul is a case in point; let alone many other cities across the nation and in other countries. 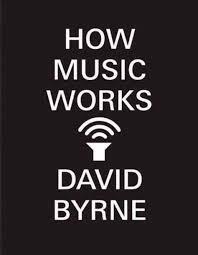 HOW MUSIC WORKS is one of my favorite books read in 2013. I hope that as we start 2014, you’ll take the time to read it too.